Quantum Key West Race Week continued thanks to the Storm Trysail Club, 140 volunteers and the support of Quantum Sail Design Group. Many sponsors joined in to continue this world class annual regatta. 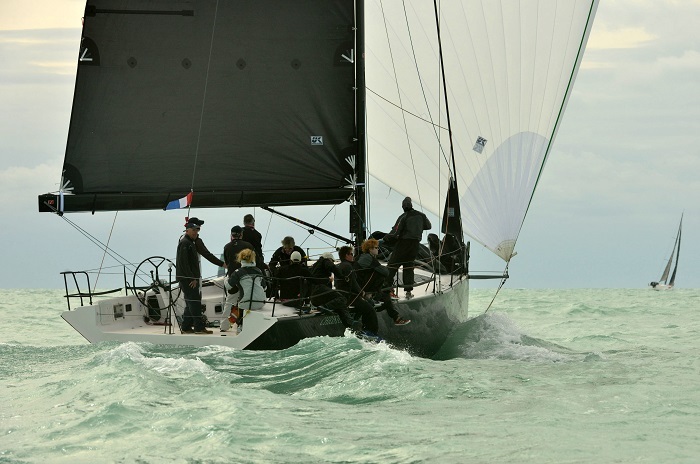 Premiere Racing, based in Marblehead, MA, built and ran Key West Race Week for over 20 years. Well received this year was awarding the 2016 Boat of the Day and Week to both Professional and Corinthian crews. All were gifted Chelsea Clocks. One of the most dominant Race Week champions was Christopher Dragon capturing IRC 2 by 13 points. Christopher Dragon, a Sydney 43 owned by Andrew and Linda Weiss of Mamaroneck, NY, finished second in Race 1 and then proceeded to reel off eight straight wins. Legendary sailmaker Butch Ulmer served as tactician and Larry Fox as navigator for Weiss, who has known both men since he was 14 years old and crewing on his father’s boat. Bella Mente, which clinched victory in the Maxi 72 class on Thursday, was selected as Quantum Boat of the Week. Hap Fauth (Minneapolis, MN) steered his big blue boat to first place in six of nine races. 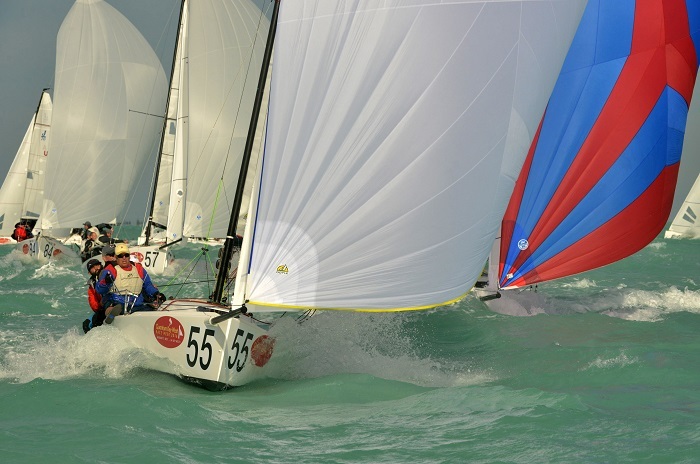 Peter Wagner (Atherton, CA) and the Skeleton Key crew made a successful debut at Quantum Key West, winning the J/111 class in dominant fashion. Skeleton Key, which does most of its racing on San Francisco Bay, reveled in the big breeze while notching seven bullets and a pair of seconds. Fifty-four J/70s entered the regatta. Carlo Alberini (Pesaro, Italy) and the crew of Calvi Network led from start to finish to win for the second straight year. “I come back every year to Key West because the regatta is so good – always great wind and excellent race management,” said Alberini, who previously raced a Farr 40 and Melges 32. Peter Duncan (Rye, NY) and the Relative Obscurity team were runner-up in the J/70 class, just four points ahead of Tim Healy (Newport, RI) and the Helly Hansen crew. 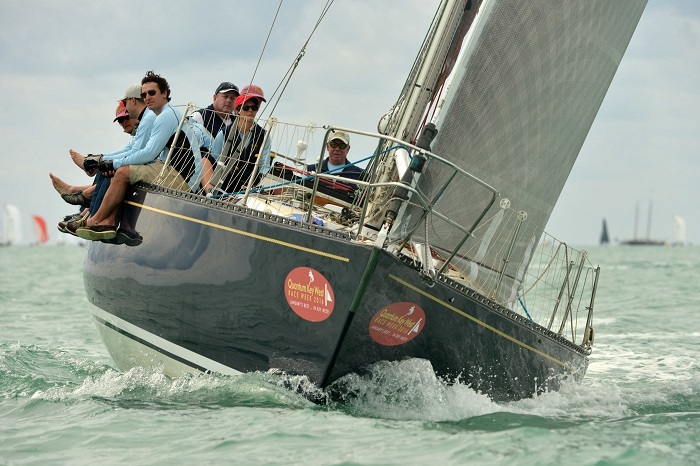 Defiant, a New York 40 owned by John Streicker of New York City, won all three-distance races in the Performance Cruising class, a new feature this year. This class and the multihulls started and finished near the harbor, with courses set around government buoys. Joseph Mele, also of New York City, steered his Swan 44 Triple Lindy to line honors in two straight races, but the Defiant team won all three races on corrected time. Principal Race Officer Bruce Bingman created courses in the range of 20 miles. And the winner of the Multihull class, like the performance cruisers, also won with straight bullets. Tom Reese’s Corsair 28R Flight Simulator from Youngstown, NY bested the much larger (and more luxurious) Gunboat 60 Arethusa, owned by Wendy and Phil Lotz (Ft. Lauderdale, FL). In several classes, the top boats battled ‘til the event’s final leg. No finish was closer though than in the TP52 class, where Doug DeVos (Ada, MI) and Quantum Racing crew just nipped Heidi & Steve Benjamin’s (Norwalk, CT) Spookie by a half point. “Steve and the entire Spookie team are terrific, just outstanding sailors. It was neck-and-neck the whole way…Fortunately, we were able to eke out a few seconds here and there on the race course,” said DeVos, who was presented with a special award for his contributions to the sport of sailing at the final prize giving ceremony. The week prior, Benjamin was named 2015 Rolex Yachtsman of the Year and won the Fort Lauderdale to Key West Race. That’s a good week! 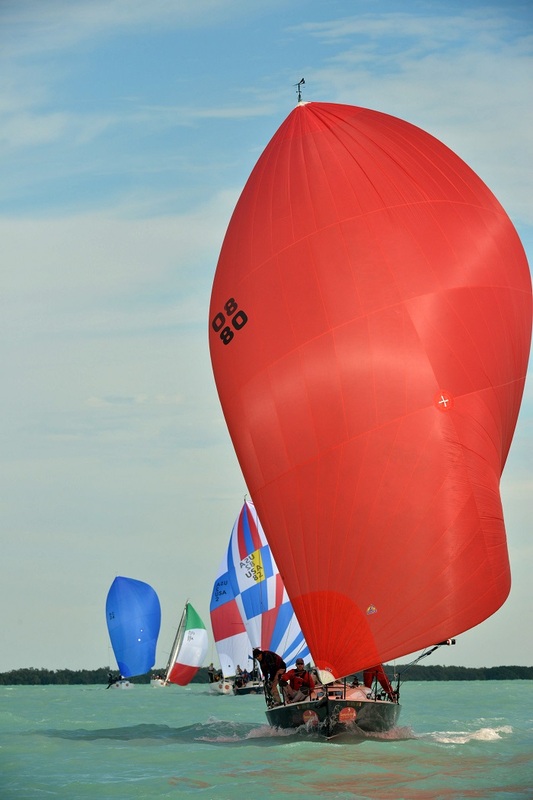 Mike Bruno (Armonk, NY) and the Wings team led at the end of each day’s racing en route to topping the J/88 class. “This is one of the world’s great regattas so I’m pretty excited,” Bruno said. “We had real good boat speed and I think the key was we were real consistent.” Giving Wings a good challenge were Iris Vogel and the Deviation team and Jeff Johnstone / Tod Patton’s Blondie 2 (Newport, RI) in the eight-boat class. The C&C 30 class is blossoming nicely. Walt Thirion (Annapolis, MD) and Themis edged Dan Cheresh and his Extreme2 (Holland, MI) in the 11-boat fleet. For results and videos, visit keywestraceweek.com. Event Media Contributed to this report.